Eddie Davenport of Tulare, California on a motorcycle, with August "Gus" Deserpa standing behind and left, at 526 San Benito Street, Hollister, California. July 4, 1947 photo by the San Francisco Chronicle's photographer Barney Petersen. 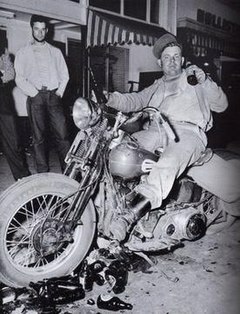 The Hollister riot was an event that occurred at the American Motorcyclist Association (AMA)-sanctioned Gypsy Tour motorcycle rally in Hollister, California from July 3 to 6, 1947. Many more motorcyclists than expected flooded the small town to watch the annual rallies, as well as to socialize and drink. A few of the motorcyclists got out of control and caused a commotion in the town, although at the end of the event, the damage was considered minor. 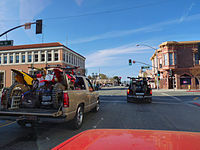 The incident, known afterwards as the Hollister riot, was sensationalized by the press with reports of bikers "taking over the town" and "pandemonium" in Hollister. The strongest dramatization of the event was a staged photo of a drunken man sitting on a motorcycle surrounded by beer bottles. It was published in Life magazine and it brought national attention and negative opinion to the event. The Hollister riot helped to give rise to the outlaw biker image. After World War II, countless veterans came back to America and many of them had a difficult time readjusting to civilian life. They searched for the adventure and adrenaline rush associated with life at war that had now left them. Civilian life felt too monotonous for some men who also craved feelings of excitement and danger. Others sought the close bonds and camaraderie found between men in the army. Furthermore, certain men wanted to combat their horrifying war memories and experiences that haunted them, many in the form of post-traumatic stress disorder. Thus, motorcycling emerged stronger than ever as a substitute for wartime experiences such as adventure, excitement, danger and camaraderie. Men who had been a part of the motorcycling world before the war were now joined by thousands of new members. The popularity of motorcycling grew dramatically after World War II because of the effects of the war on veterans. Looking north from the east side of San Benito at Fifth, in 2007. Many of the arrests took place in front of the building on the left. Driving south on San Benito towards Fifth in 2009. This street was the scene of drag races and motorcycle stunts. The SF Chronicle reported: "Armed with tear gas guns, the officers herded the cyclists into a block on San Benito Street, between Fifth and Sixth Streets, parked a dance band on a truck and ordered the musicians to play". Throughout the 1930s, Hollister, California hosted an annual Fourth of July gypsy tour event. Gypsy tours were American Motorcyclist Association-sanctioned racing events that took place all over America and were considered to be the best place for motorcyclists to converge. The annual event consisted of motorcycle races, social activities, and lots of partying. In Hollister, the event and the motorcyclists were very welcome. Especially because Hollister was a very small town, with only about 4,500 people, the rally became a major event in its yearly life as well as an important part of the town's economy. Due to World War II, the rally was canceled, but the event organized for 1947 was the revival of the Gypsy Tour in Hollister. On July 3, 1947, festivities in Hollister began. But as previously mentioned, the popularity of motorcycles had grown dramatically and this rise in popularity caused one of the main problems of this event: massive attendance. Around 4,000 motorcyclists flooded Hollister, almost doubling the population of the small town. They came from all over California and the United States, even from as far away as Connecticut and Florida. Motorcycle groups in attendance included the 13 Rebels, Pissed Off Bastards of Bloomington, the Boozefighters, the Market Street Commandos, the Top Hatters Motorcycle Club, and the Galloping Goose Motorcycle Club. Approximately ten percent of attendees were women. The town was completely unprepared for the number of people that arrived. The large attendance was unexpected, since not nearly as many people had come in previous years. Initially the motorcyclists were welcomed into the Hollister bars, as the influx of people meant a boom in business. But soon, they started causing a problem in Hollister. The drunken motorcyclists were riding their bikes through the small streets of Hollister and consuming huge amounts of alcohol. They were fighting,[unreliable source?] damaging bars, throwing beer bottles out of windows, racing in the streets, and other drunken actions. There was also a severe housing problem. The bikers had to sleep on sidewalks, in parks,[unreliable source?] in haystacks and on people's lawns. By the evening of July 4, "they were virtually out of control". This was all too much for the seven-man police force of Hollister to handle. The police tried to stop the motorcyclists' activities by threatening to use tear gas[clarification needed] and by arresting as many drunken men as they could. Also, the bars tried in vain to stop the men from drinking by refusing to sell beer and voluntarily closing two hours ahead of time. Eyewitnesses were quoted as saying, "It's just one hell of a mess", but that "[the motorcyclists] weren't doing anything bad, just riding up and down whooping and hollering; not really doing any harm at all." The ruckus continued through July 5 and slowly died out at the end of the weekend as the rallies ended and the motorcyclists left town. At the end of the Fourth of July weekend and the informal riot, Hollister was littered with thousands of beer bottles and other debris and there was some minor storefront damage. About 50 people were arrested, most with misdemeanors such as public intoxication, reckless driving, and disturbing the peace. There were around 60 reported injuries,[unreliable source?] of which three were serious, including a broken leg and skull fracture. Other than having to witness the chaos of the weekend, no Hollister residents suffered any harm at all. [clarification needed] A City Council member stated, "Luckily, there appears to be no serious damage. These trick riders did more harm to themselves than the town." The small riot came to national prominence through media coverage of the event. However, the articles that were written about the riot were greatly exaggerated and sensationalized the actual events. However, the reliability of the striking photo has been debated, as many sources say that it was staged. [unreliable source?] The photograph was taken by Barney Petersen of the San Francisco Chronicle. The Chronicle did not run any images of the event. The bearded individual standing in the background of the photograph, Gus Deserpa, has said he is sure that the photograph was staged by Petersen, and gave the following account: "I saw two guys scraping all these bottles together, that had been lying in the street. Then they positioned a motorcycle in the middle of the pile. After a while this drunk guy comes staggering out of the bar, and they got him to sit on the motorcycle, and started to take his picture." Deserpa claims he deliberately tried to sabotage the staging by stepping into the shot, but to no avail. Barney Peterson's colleague at the Chronicle, photographer Jerry Telfer, said it was implausible that Peterson would have faked the photos. Telfer said, "Barney was not the type to fake a picture. Barney was the kind of fellow who had a very keen sense of ethics, pictorial ethics as well as word ethics." Modern Hollister continued to host motorcycle rallies and commemorate the events of July 1947. The AMA purportedly released a statement saying that they had no involvement with the Hollister riot, and, "the trouble was caused by the one per cent deviant that tarnishes the public image of both motorcycles and motorcyclists" and that the other ninety-nine per cent of motorcyclists are good, decent, law-abiding citizens. However, the American Motorcyclist Association has no record of ever releasing such a statement. A representative of the AMA said in 2005, "we've been unable to attribute [the term 'one-percenter'] original use to an AMA official or published statement — so it's apocryphal." The AMA's statement led to one-percenter being widely used to describe outlaw motorcycle clubs and motorcyclists. The Hollister riot had little effect on the town. The nationwide fear of motorcyclists did not result in many changes in Hollister. Bikers were welcomed back[clarification needed] and rallies continued to be held in the years after the riot. In fact, the town held a 1997 50th anniversary rally to commemorate the event. A short story, Cyclists' Raid by Frank Rooney, is based on the events of the Hollister riot and was originally published in the January 1951 issue of Harper's Magazine. This story made up the basis of the plot of the 1953 film The Wild One, starring Marlon Brando. However, it bears little resemblance to the actual events of the Hollister riot. The movie only worked to further bring the riot into public light and portray motorcyclists as misfits and outlaws. ^ a b c d e f g h i j k l m n o p q r s t C. I. Dourghty. "More On Hollister's Bad Time", San Francisco Chronicle July 6, 1947. ^ Mark S. Ciacchi. "Outlaw Motorcycle Clubs and the American Vets." Vet Extra 12 (2003): 10-11. Via Dulaney, 2005. ^ National Center for Post Traumatic Stress Disorder (NCPTSD). "Facts about PTSD." NCPTSD Website. 16 March 2004. Via Dulaney, 2005. ^ a b "The History of the AMA." American Motorcyclist Association (AMA). May 21, 2005. Via Dulaney, 2005. ^ C. I. Dourghty. "Havoc In Hollister", San Francisco Chronicle July 5, 1947. ^ a b c d e "The Real 'Wild Ones', the 1947 Hollister Motorcycle Riot." Classic Bike 1998. ^ a b Stephen L. Mallory, Understanding Organized Crime. (Sudbury: Jones and Bartlett, 2007) 152. ^ "History of the Rally." Hollister Independence Rally Committee. 2005. Via Dulaney, 2005. ^ Interview with Catherine Dabo. Classic Bike 1998. ^ Hollister Independence Rally Committee. 2005. ^ a b Interview with Gus Deserpa. Classic Bike. ^ Reynolds, Tom. Wild Ride: How Outlaw Motorcycle Myth Conquered America. New York: TV Books, 2000. Via Dulaney, 2005. ^ Frank Rooney. "Cyclists' Raid: a Story", Harper's Magazine. January 1951. 34–44. This page was last edited on 16 February 2019, at 02:27 (UTC).